Santander Internationalisation Mobility Support Santander Universities Scholarship 2014/15. Leung worked as a part-time waitress in a hotel and, after two months, decided to start her studies in order to find out more about the hospitality industry. Whilst studying at a college in Hong Kong, Leung was given the opportunity to further her experience by undertaking an internship at a hotel in China. Adapting to a new culture has been a difficult but fun process for Leung in the UK, and it was this desire to experience new cultures and to learn a new language which was part of her decision to then apply for a Santander Universities Scholarship. After being awarded a scholarship to commence her travels to Barcelona in June 2014, Leung completed a Spanish summer course at the Universidad Autónoma de Barcelona (UAB). The course allowed Leung to immerse herself within a friendly community of fellow Spanish speakers, enhance her awareness of another culture, customs, and way of life, staying with a local resident family which enabled her to practise her new language skills on a day to day basis. 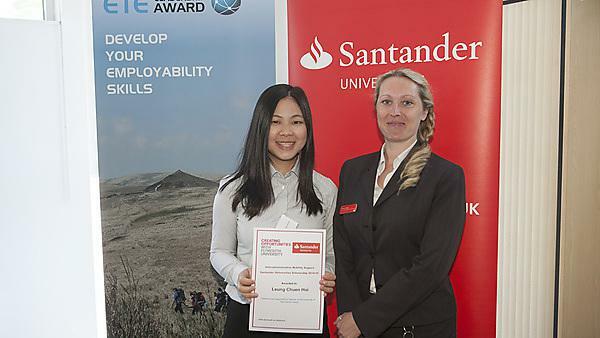 Leung recognises that the Santander Universities Scholarship has provided a fundamental basis for her to provide better customer service in the future, adding an extra selling point to her CV, and given her a positive boost for her career development in the hospitality and tourism industry.